I wasn’t expecting this when Alex in Virginia sent me a link. 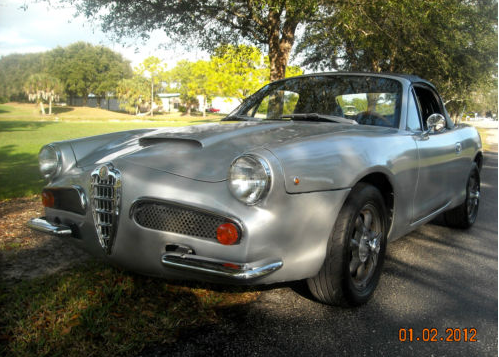 I look at kit cars occasionally on eBay to check out the latest in Porsche Laser 917’s and the like, but not often enough to catch all the weirdness that passes through -including this: an Alfa Giulietta Spider treatment kit on a Miata! 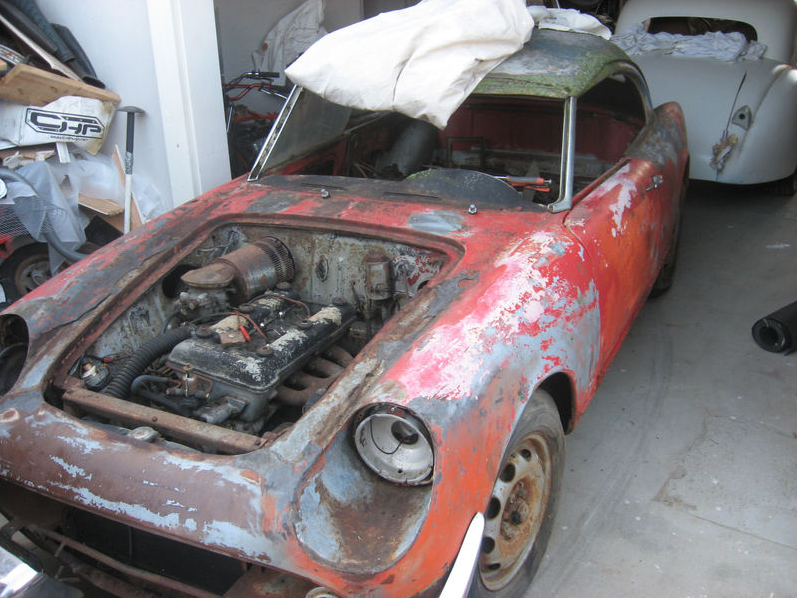 I’ve seen lots of Porsche 356 kits, Austin Healey 3000 kits and others, but never Giulietta kit -not that this looks a whole lot like a Giulietta, but you get my meaning. The quality of the finish isn’t too bad for this sort of thing, and being a Miata, it probably performs admirably. Knock-offs look like something from the SpyHunter video game. Center grill looks like a genuine Alfa part. 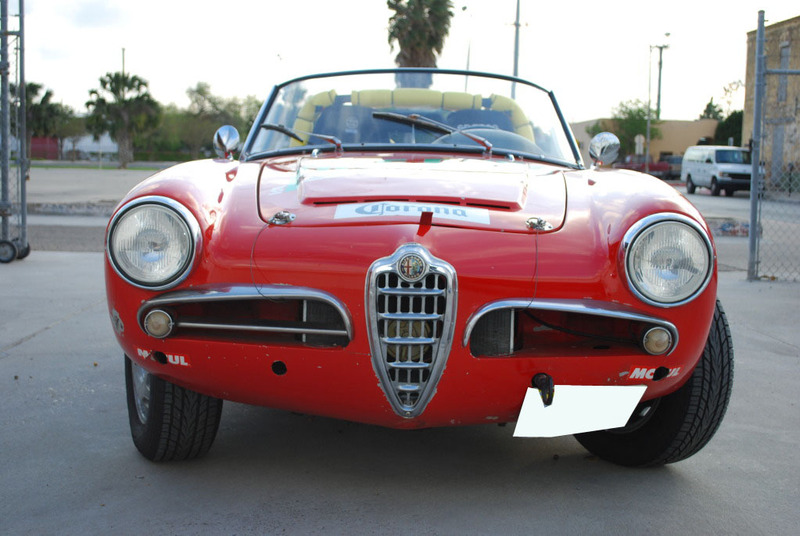 Giulietta Spider 750D 1495*00647. This odd-ball home-brew special is on eBay right now out of Sacramento. I am going to assume this is all reversible, and only the front end changes will present any challenge not part of routine rust repair. 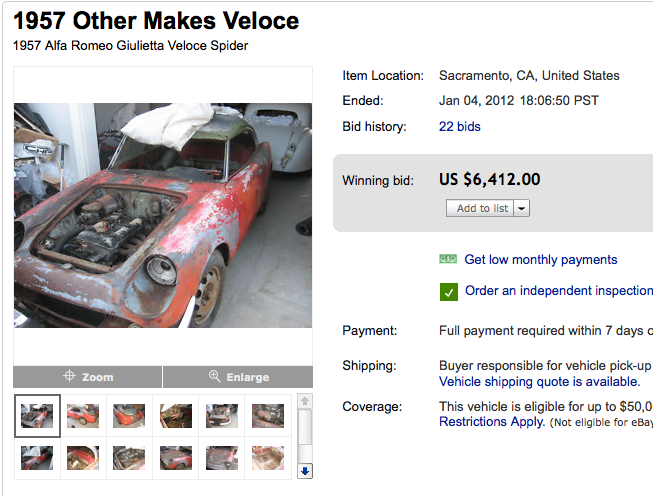 Title of the auction says ‘Veloce’ but 00647 is not listed as such in d’Amico & Tabucchi. If the engine is matching numbers to the body -and I believe it is based on the fuel line configuration- this is actually a pretty good first step toward early Spider ownership in project form. Me? I’d vacuum out the leaves and roll as-is to Pebble Beach -you’d turn more heads in this than an 8C 2900. If you had this car and the Market 216 car, you’d corner a dubious market. Roof gutter definitely recalls the VW bug. Too bad they didn’t have access to a Sprint roof to work with -might have been more successful. Firewall is early Spider 750D leading me to believe more strongly that the vin is correct. 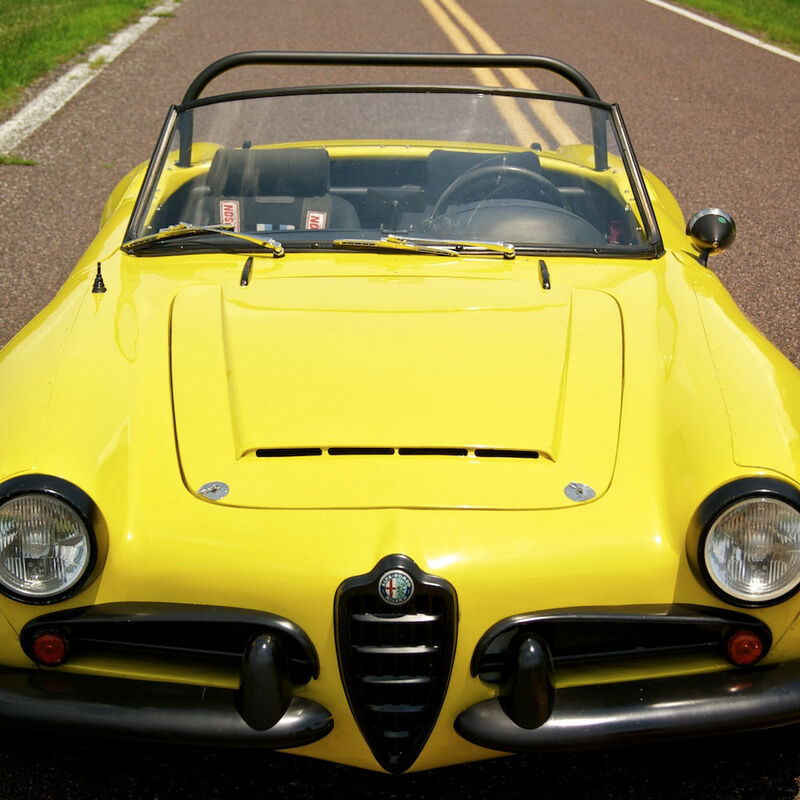 Headlight openings are likely 70’s Alfa Spider sections. Engine looks remarkably complete and original. Modified Sprint Speciale’s 3: another Zat car?? Elmar sent me this picture yesterday, describing it as ‘pimped’. It reminded me that I’ve been owing the ‘Modified SS’s’ post series an update for a while. This one is dedicated to the modern era super sports type mod’s that probably started with the Zat SS (381238 was the basis) that eventually sold through RM in 2008 for just under $50K. I can’t verify the auction description below -but it states that 4 Zat SS’s were made and two survive. Giulietta SS 10120*00215. 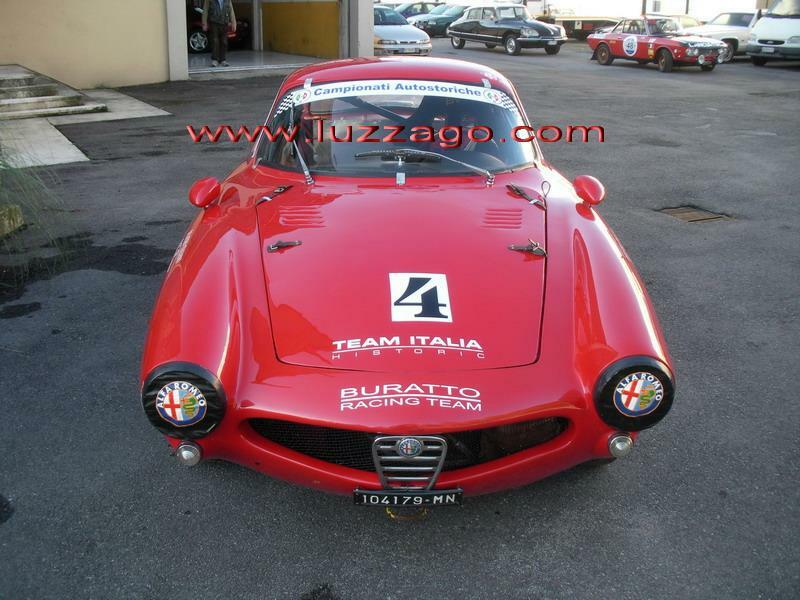 This car is listed on Luzzago at the moment out of Italy. It has been modified quite a bit for racing but looks as though the removal of some decals and moving toward a more stock interior might yield a fun street racer. Headlight covers aren’t my thing and the grill is from who knows what, but under here is an SS.